Dendrobium orchids are frequently used in leis, corsages and wedding arrangements. These tropical flowers have tall sturdy stems–growing up to two feet tall–with clusters of blossoms in white, purple or pink. Despite their delicate appearance, if properly prepared, fresh-cut dendrobium orchids can last for several weeks. Submerge the dendrobium orchids in water for 10 to 15 minutes. According to Beautiful Orchids (see Resources), this will help refresh the blooms. Handle the flowers carefully to avoid damaging the stems or blossoms. Cut a half inch off the base of the orchids’ stems, using a sharp knife or scissors. Cut the stems at an angle, which will allow the flowers to absorb a greater amount of water. Fill a clean vase more than half full with hot water; Beautiful Orchids recommends the temperature of the water to be 100 degrees. Some cut orchids come with a packet of flower food that is added to the water. If the flowers do not have this, Grower’s Box (see Resources) suggests using generic spring water. Remove any leaves that will be underwater, and place the orchids in the water. Place the vase of orchids in a cool spot out of sunlight and away from drafts, including drafts caused by ceiling fans, to prevent the flowers from dehydrating. Grower’s Box recommends storing the orchids at a temperature below 65 degrees. Refresh the blooms of the orchids by misting them daily with water. Change the water in the vase every two to three days. Recut the stems each time you change the water. Using hot water causes the cut stems to open up, allowing more water to be absorbed. Leaving leaves and foliage underwater for long periods of time can cause bacteria, which will damage the orchids. 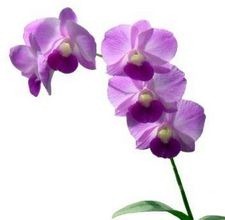 Cut Flower Wholesale explains that dendrobium orchids are "slightly sensitive to ethylene. To avoid ethylene buildup, you’ll want to ensure adequate ventilation and sanitary conditions." Ethylene, according to Merriam-Webster, is a colorless, gaseous hydrocarbon that occurs in plants as a natural growth regulator in order to promote the ripening of fruit.